A tropical resort vacation condo rental on Kauai without the high price. COMPLETE RENOVATION NOVEMBER 2015 and more in 2016. New large shower and full kitchen also. Convenient ground floor condo. Only steps to the pool and our beautiful beach. Click on video tab to see a view of our great beach and lawn. Ages from 1 to 91 enjoy our beach. Great for snorkeling, surfing or just relaxing and watching for whales in the winter and sea turtles all year. Walk out of your sliding door to the pool or bar-be-que. Convenient parking at your door and free tennis always. A great value because you have a full kitchen, dining and living room. Not just a suite or hotel room. Roam our beautiful gardens and lawn and the sacred Hawaiian heiau (religious) site. Excellent communication and support, very professional and helpful. We look forward to booking at Lae Nani in the future. We stayed at Lae Nani for a week with our 8-month-old son. It was the perfect spot for a relaxing vacation. We loved the convenience of being on the ground floor a few steps from the pool and the beach. Our son played on the grass lawn and we went swimming every day. The condo was clean and had everything we needed to enjoy our stay. 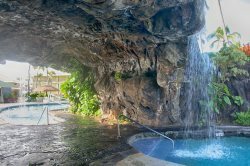 The location in Kapaa is ideal - short drive from the airport, easy drive south to Poipu, a few minutes from Lydgate beach (great for kids! ), close to shopping for groceries, and several shops and restaurants within walking distance. Would definitely recommend this place or consider visiting again if we make it back to Kauai. Recommended for: Families with Young Children, Adventure Seekers, Age 55+. My (adult) son and I were there for a short trip and everything was great - the condo was very clean and comfortable, the grounds are beautiful and very well kept, nice swimming pool and beach. We even were fortunate to have two monk seals on the beach for a couple of days. Wish we could have stayed stayed longer. It is also a convenient location to visit rest of Kauai. $250 deposit to hold the reservation, balance due 60 days prior to arrival. Checks and charge cards accepted.